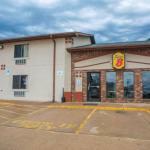 With easy access to Highway 62 the economically priced Super 8 Mountain Home sweetens the deal for our guests with perks like free breakfast and complimentary parking. The two-story hotel has 52 rooms featuring coffeemakers hairdryers free local phone calls and cable TVs with 70 channels. High-speed internet access is available. Fuel up in the morning with a complimentary continental breakfast served daily in the lobby. The Super 8 offers plenty of free parking for trucks and RVs. Pets are allowed for an additional fee. The Super 8 is three miles from Arkansas State University - Mountain Home and 10 miles from Norfolk National Fish Hatchery Lake Norfolk the North Fork River and the White River. Bull Shoals Lake and Caverns are 12 miles away and it's 30 miles to the Buffalo River. Little Rock National Airport is 156 miles.